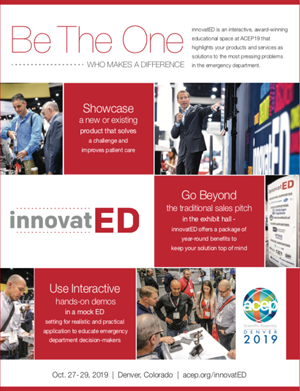 innovatED gives you a sneak peek of not-yet-released ED products from start-up companies offering the latest innovations in emergency medicine. These companies are listed with their weblinks under the Start-ups category below. Please explore these innovators who are changing the future of emergency medicine. ACEP thanks these companies and the generous innovatED sponsors listed under the healthcare categories for their support. Collective Medical empowers care teams to improve patient outcomes by closing the communication gaps that undermine patient care. Collective’s nationwide network and real-time event notification platform is trusted by care teams to identify at-risk and complex patients and facilitate actionable collaboration to make better care decisions. AngelMD is a healthcare investment community combining the world's largest network of healthcare startups with physicians, investors, and industry with the goal of creating successful outcomes. We connect physicians and angel investors with innovative companies across multiple clinical applications and innovation categories to positively impact the future of healthcare. Brault is a clinical intelligence partner for independent physician groups and hospitals – specializing in Revenue Optimization and Practice Management. The organization manages over 4.2 million annual visits for clients across 18 states and is led by emergency physician (and current Chair of EDPMA) Andrea Brault, MD, MMM, FACEP. NIDA’s mission is to advance science on the causes and consequences of drug use and addiction and to apply that knowledge to improve individual and public health. NIDA's National Drug Abuse Treatment Clinical Trials Network (CTN) provides a foundation for conducting research with the primary goal of bridging the gap between the science of drug treatment and adoption in practice through the study of scientifically based interventions in real world settings. Code 3 ER and Urgent Care offers affordable, highly qualified care from board-certified Emergency Medicine physicians with no wait times. With Lab, CT, X-Ray, and Ultrasound located on-site you get results three times faster and pay less than at the average hospital emergency room. EM residents and medical students - Your life has never been busier, but you’re driven by the need to help others – it’s why you do what you do. We get it because we’ve been there too. You can rely on us to help you every step of the way, so you can easily find the resources, mentors, and connections you need to succeed. Why do we do it? Because caring about others is who we are, and that means we care about you too. We are EMRA. The John A. Hartford Foundation, based in New York City, is a private, nonpartisan, national philanthropy dedicated to improving the care of older adults. The leader in the field of aging and health, the Foundation has three areas of emphasis: creating age-friendly health systems, supporting family caregivers, and improving serious illness and end-of-life care. For more than 60 years, Kaiser Permanente has provided quality health care. We are dedicated to improving the health of our members and the communities we serve by creating safe, healthy environments, and providing care and coverage for all. Since 1978, VITAS® Healthcare has kept terminally ill patients at home and comfortable by managing symptoms of serious, progressive illness. We offer goals-of-care consults, even in the ED. When medically necessary, our interdisciplinary teams bring continuous care to the home and can provide inpatient care until symptoms are under control. With research spanning healthcare in the home, hospital, and community-based organizations, the West Health Institute is studying how senior-specific healthcare delivery can be improved to be enable successful aging in place. With talented and diverse group of researchers and professionals across healthcare delivery, social science, data science, and medical professions, we explore opportunities that will improve acute care for seniors in the emergency department, home, and community; chronic care settings for older adults who may need care at home; and supportive services so seniors can receive the care they need, at a lower cost, wherever they are. Vapotherm is the inventor and leader of High Velocity Nasal Insufflation (HVNI), a first line tool in the management of respiratory distress, including hypercapnia, hypoxia and dyspnea. Vapotherm Hi-VNI™ Technology is a viable alternative to pressure-based mask therapies (CPAP, NIPPV) with the comfort and ease of use of a basic nasal cannula. Pfizer: At Pfizer are committed to applying science and our global resources to improve health and well-being at every stage of life. We strive to provide access to safe, effective and affordable medicines and related health care services to the people who need them. Bristol-Myers Squibb: Bristol-Myers Squibb is a global BioPharma company firmly focused on its mission to discover, develop and deliver innovative medicines to patients with serious diseases. Around the world, our medicines help millions of people in their fight against such diseases as cancer, cardiovascular disease, hepatitis B and hepatitis C, HIV/AIDS and, rheumatoid arthritis. Boehringer Ingelheim is one of the world’s 20 leading pharmaceutical companies. Headquartered in Germany, the company operates globally with more than 50,000 employees. The family-owned company has been committed to researching, developing, manufacturing and marketing novel treatments for human and veterinary medicine. Also visit us on Twitter @BoehringerUS. A novel and disruptive, non-invasive automated platform technology to risk stratify cardiac patients based on their hemodynamic state. The “Ventor” is a blind-insertion advanced airway + ventilator system that simplifies a procedure doctors struggle with. Quick Accurate Reproducible - Automated Ultrasound Analysis. Software that improves the quality of care during emergency medical events. Precision Prevention - mapping patient data into evidence-based treatments to identify actionable gaps in care and treatment opportunities. An ultra-portable, affordable, user-friendly AED that will make this lifesaving technology accessible and attractive to the consumer market. Intelligent clinical agents for the healthcare industry that improve information quality and communication efficiency. The LightSpeed Intubation System (LSI) provides easier, faster and safer intubation compared to the current standard of care. NiCO™, the world’s first laser-based pulse oximeter, measures all four hemoglobin species to provide crucial clinical information at the point of care. ORCHID Valve brings tension-based break-a-ways to medical grade tubing, flagship product focused on IV's. Improving the patient experience by providing a backstage pass for patients accessing emergency health care services. Automated urinometers designed to improve the prediction and diagnosis of Acute Kidney Injury (AKI). Through The Cords articulating introducer gives you the control needed to get up and through the cords. AI-based Resource Prediction Engine and Team Assignment Software reduce costs, increase revenue, and boost patient satisfaction.